Beginning this Monday, Cherry Hill residents will be able to pay property taxes and Township sewer bills online by credit card, debit card or electronic check. Tax payments are due tomorrow, Feb. 1, for the first quarter of 2014; however, payments can be made without penalty until the close of business on Monday, Feb. 10. Users of the online payment system are advised that the payment processing company will assess a 2.39% convenience fee for credit and debit card payments and a 99-cent fee for e-check payments. No fees will be charged by the Township. Credit and debit card payments cannot be accepted at the Tax Office or by phone. Click here to visit the payment site. (Please note that the payment option will not be visible until Monday, Feb. 3.) For more information, visit the Tax Collector’s page on the Township website, or call (856) 488-7880. As part of an ongoing water main replacement project, New Jersey American Water is scheduled to replace the water main on Kitty Hawk Road between Borton’s Mill and Iron Master roads, beginning on or about Wednesday, Feb. 5. Service will not be affected other than for a short period of time when individual service lines will be connected to the newly installed water main. Homeowners will be notified when that brief shutoff is scheduled to occur. Access to homes and driveways will be maintained throughout the duration of the project. Click here for more information. For concerns about this project, please contact John Graham or Jacquelyn Weaver at (856) 764-6920 or 6915. Cherry Hill Township and the AARP have once again partnered to offer seniors free tax-preparation assistance twice a week until April 15. From 10 a.m. to 2 p.m. every Tuesday and Friday beginning Feb. 4, Tax-Aide volunteers will be at Town Hall to help residents over 55 prepare their 2013 state and federal tax returns, as well as Homestead Benefit Credit and Property Tax Reimbursement forms. No appointments are necessary. All tax-prep sessions will take place in the N. John Amato Council Chambers (Room 208) at Town Hall. Electronic filing and direct deposit are available to help expedite returns. Click here for more information, or call the AARP directly at (888) AARP-NOW. This week, the Cherry Hill Police Department lost a member of its family. Retired K-9 Boz, #K12, passed away on Monday, Jan. 27. 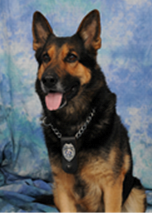 K-9 Boz was born on March 11, 2000, in the Czech Republic, and joined the Cherry Hill Police Department in November 2001. After graduating from the Philadelphia Police Canine Academy, Boz became the first explosive-detection canine in the CHPD Canine Unit’s 20-year history, and was Cherry Hill’s first explosive-detection K-9 certified by the ATF. Boz faithfully served for nine years and one month, from Nov. 26, 2001, until Jan. 3, 2011. Please join me in sending our sincerest condolences to K-9 Boz’s handler, Police Officer Kevin Seta, his family, and the entire Cherry Hill Police Department during this time of loss. The Camden County Department of Public Works will implement temporary lane shifts on the Woodcrest Road Bridge, over the PATCO rail line, beginning Monday, Feb. 3. This temporary traffic-pattern will enable the county to complete necessary structural upgrades along the span. Click here for more information. Are you looking for a unique Valentine's Day gift that also benefits an important part of the community? The Cherry Hill Public Library and the Friends of the Library are offering a special price on engraved brick pavers that will be placed in the Library's Friendship Grove. The bricks, typically priced at $75, are available for $60 ($40 for previous Friendship Grove donors) through Feb. 14. Click here to download an order form. For more information, call (856) 667-0300 or e-mail cherryhillfriends@gmail.com. Did you know that Cherry Hill has a program to help some homeowners cover the cost of renovating or rehabilitating their homes? The Township’s Housing Improvement Program provides eligible homeowners with funds to rehabilitate their homes and complete repairs that include code-related items, mechanical and plumbing systems, and upgrades to make homes more weather-tight. The program provides zero-interest deferred loans up to $25,000 for homeowners who meet the program requirements. Income limits apply. 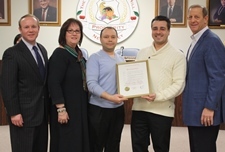 The owner-occupied Home Improvement Program is administered on behalf of the Township through a shared-service agreement with Camden County. Click here to read the full news release on this program. For more information or to apply, homeowners should contact Camden County at (856) 751-2242 or click here. In honor of Black History Month, “Boardwalk Empire” author Nelson Johnson will return to Cherry Hill to discuss his newest book, “The Northside: African Americans and the Creation of Atlantic City” at 7 p.m. Thursday, Feb. 6. This great program is free, and will be held in the Cherry Hill Public Library Conference Center, 1100 N. Kings Highway. For more information, click here, call (856) 488-7886, or email CHHC@chtownship.com. This past Monday night, Council and I presented a special proclamation to Kaminski’s Sports Bar and Restaurant as a token of our appreciation for the restaurant’s years of giving back to this community. Since opening its doors in 1965, Kaminski’s has always been an asset to and friend of Cherry Hill. Its owners have supported a number of local initiatives, including Township holiday events, my Mayor’s Wellness Campaign, and our Welcome to Cherry Hill reception in 2013. Most notably, in the days following Hurricane Sandy in 2012 – when half of Cherry Hill remained without power – Kaminski’s donated hot food for countless residents in need of assistance. Their philanthropy can’t be summed up in just one paragraph – and for that reason alone, we were proud to honor their contributions to Cherry Hill throughout the years. Congratulations, and thank you! The Cherry Hill Fire Department will resume its smoke alarm campaign this weekend, going door-to-door in several neighborhoods offering free smoke alarm testing and installation. This weekend, firefighters will be out in Brookmeade and Batesville on Saturday and Brookmeade, Batesville and Brookfield on Sunday. The list of locations is updated each week on the Department’s website and Facebook page. Check back often to see when the CHFD will be in your neighborhood. If you are in need of a smoke alarm immediately, please call (856) 429-7441 to schedule an appointment. Warm weather may be months away, but the Animal Welfare Association (AWA) is offering cat owners a chance to “Beat the Heat” by spaying cats in advance of their heat cycles, to prevent unwanted litters from being born this spring. Throughout the month of February, the AWA is offering 375 cat owners a special $20 rate for spay and neuter surgeries for female cats, with the help of funding from PetSmart Charities. Click here to learn more, or call (856) 424-2288. Lou & Ann Napolitano opened their delicatessen on Route 70 in 1959. Lou, who worked for Camden's Mighty Good Baking Company at the time, came up with the idea while working on his delivery route one day, and nearly 55 years later, it remains as one of Cherry Hill's oldest family-owned businesses. Today, the Deli is operated by Lou Napolitano, Jr., who has worked there since childhood! Each of the businesses we've highlighted in the past few weeks has become a living piece of Cherry Hill’s history, and I’m honored to be able to recognize their longstanding investment and presence in our community. Read more about this project in the Cherry Hill Sun. If you know of a business that has been around for 50 years or more, please let us know by calling (856) 488-7878, or e-mailing me at MayorCahn@chtownship.com. Beginning this Monday, Cherry Hill residents will be able to pay property taxes and Township sewer bills online by credit card, debit card or electronic check. Tax payments are due tomorrow, Feb. 1, for the first quarter of 2014; however, payments can be made without penalty until the close of business on Monday, Feb. 10. Users of the online payment system are advised that the payment processing company will assess a 2.39% convenience fee for credit and debit card payments and a 99-cent fee for e-check payments. No fees will be charged by the Township. Credit and debit card payments cannot be accepted at the Tax Office or by phone. Click here [https://wipp.edmundsassoc.com/Wipp0409/] to visit the payment site. (Please note that the payment option will not be visible until Monday, Feb. 3.) For more information, visit the Tax Collector’s page [http://www.cherryhill-nj.com/index.aspx?nid=193] on the Township website, or call (856) 488-7880. Cherry Hill Township and the AARP have once again partnered to offer seniors free tax-preparation assistance twice a week until April 15. From 10 a.m. to 2 p.m. every Tuesday and Friday beginning Feb. 4, Tax-Aide volunteers will be at Town Hall to help residents over 55 prepare their 2013 state and federal tax returns, as well as Homestead Benefit Credit and Property Tax Reimbursement forms. No appointments are necessary. All tax-prep sessions will take place in the N. John Amato Council Chambers (Room 208) at Town Hall. Electronic filing and direct deposit are available to help expedite returns. Click here [http://www.cherryhill-nj.com/CivicAlerts.aspx?AID=451] for more information, or call the AARP directly at (888) AARP-NOW. The Camden County Department of Public Works will implement temporary lane shifts on the Woodcrest Road Bridge, over the PATCO rail line, beginning Monday, Feb. 3. This temporary traffic-pattern will enable the county to complete necessary structural upgrades along the span. Click here [http://www.camdencounty.com/county-news/repairs-slated-two-camden-county-bridges-february-3?utm_source=] for more information. Are you looking for a unique Valentine's Day gift that also benefits an important part of the community? The Cherry Hill Public Library [http://www.chplnj.org/] and the Friends of the Library are offering a special price on engraved brick pavers that will be placed in the Library's Friendship Grove. The bricks, typically priced at $75, are available for $60 ($40 for previous Friendship Grove donors) through Feb. 14. Click here [http://www.chplnj.org/friends%20brick%20sale%20special.pdf] to download an order form. For more information, call (856) 667-0300 or e-mail cherryhillfriends@gmail.com. Did you know that Cherry Hill has a program to help some homeowners cover the cost of renovating or rehabilitating their homes? The Township’s Housing Improvement Program provides eligible homeowners with funds to rehabilitate their homes and complete repairs that include code-related items, mechanical and plumbing systems, and upgrades to make homes more weather-tight. The program provides zero-interest deferred loans up to $25,000 for homeowners who meet the program requirements. Income limits apply. The owner-occupied Home Improvement Program is administered on behalf of the Township through a shared-service agreement with Camden County. Click here [http://www.cherryhill-nj.com/CivicAlerts.aspx?AID=443] to read the full news release on this program. For more information or to apply, homeowners should contact Camden County at (856) 751-2242 or click here [http://www.cherryhill-nj.com/index.aspx?nid=153.] . In honor of Black History Month, “Boardwalk Empire” author Nelson Johnson will return to Cherry Hill to discuss his newest book, “The Northside: African Americans and the Creation of Atlantic City” at 7 p.m. Thursday, Feb. 6. This great program is free, and will be held in the Cherry Hill Public Library Conference Center, 1100 N. Kings Highway. For more information, click here [https://www.facebook.com/photo.php?fbid=208546239339591&set=a.153402198187329.1073741828.153392904854925&type=1&theater] , call (856) 488-7886, or email CHHC@chtownship.com. The Cherry Hill Fire Department will resume its smoke alarm campaign this weekend, going door-to-door in several neighborhoods offering free smoke alarm testing and installation. This weekend, firefighters will be out in Brookmeade and Batesville on Saturday and Brookmeade, Batesville and Brookfield on Sunday. The list of locations is updated each week on the Department’s website [http://www.cherryhillfire.blogspot.com/2013/12/2014-smoke-alarm-campaign.html] and Facebook page [https://www.facebook.com/pages/Cherry-Hill-Fire-Department/249480684755?ref=br_tf] . Check back often to see when the CHFD will be in your neighborhood. If you are in need of a smoke alarm immediately, please call (856) 429-7441 to schedule an appointment. Warm weather may be months away, but the Animal Welfare Association (AWA) is offering cat owners a chance to “Beat the Heat” by spaying cats in advance of their heat cycles, to prevent unwanted litters from being born this spring. Throughout the month of February, the AWA is offering 375 cat owners a special $20 rate for spay and neuter surgeries for female cats, with the help of funding from PetSmart Charities. Click here [http://www.cherryhill-nj.com/CivicAlerts.aspx?AID=438] to learn more, or call (856) 424-2288. Lou & Ann Napolitano opened their delicatessen on Route 70 in 1959. Lou, who worked for Camden's Mighty Good Baking Company at the time, came up with the idea while working on his delivery route one day, and nearly 55 years later, it remains as one of Cherry Hill's oldest family-owned businesses. 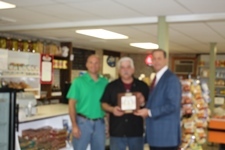 Today, the Deli is operated by Lou Napolitano, Jr., who has worked there since childhood! Each of the businesses we've highlighted in the past few weeks has become a living piece of Cherry Hill’s history, and I’m honored to be able to recognize their longstanding investment and presence in our community. Read more about this project in the Cherry Hill Sun [http://sj.sunne.ws/2013/11/26/cherry-hill-honors-longstanding-businesses-of-50-or-more-years/] . If you know of a business that has been around for 50 years or more, please let us know by calling (856) 488-7878, or e-mailing me at MayorCahn@chtownship.com [mailto:MayorCahn@chtownship.com] .